Christian received his B.A.Sc. in Computer Engineering from the University of Waterloo in 2005. His design projects included a small-scale prototype of a voice-controlled wheelchair, and an active lumbar-support comfort system for automobiles. Christian completed his M.Sc. in Computing and Information Science at the University of Guelph in 2007 under the supervision of Dr. Gary Grewal. His research focused on developing hardware-accelerated techniques for reducing run-time for Field Programmable Gate Array (FPGA) placement. He followed up his M.Sc. research by working towards a Ph.D. in Computer Science at the University of Guelph, focusing on developing scalable, highly-parallel techniques for performing FPGA placement, including the use of many-core architectures, such as the NVIDIA CUDA platform. 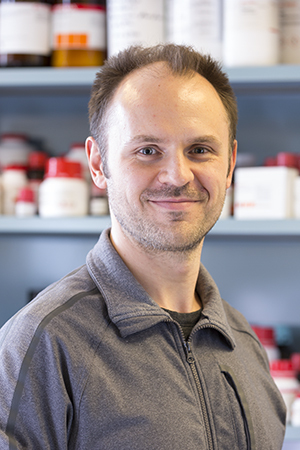 Christian joined the Wheeler lab in 2013 as a full-time research associate. He is interested in developing automated control systems for high-throughput and point-of-care microfluidic devices. Outside of the lab, Christian enjoys playing guitar, cooking, biking, snowboarding, and hacking away on pet programming projects.